I won this gun on an auction last week. The guy said it is unused and I see no reason to dispute that. He bought it to go with a costume. Didn't come with a box or papers, though the user manual is easy enough to find on the 'net. Like them both, but really fond of the Schofield! How do the 'cartridges' work? I ordered one for $89. On the Schofield, the BBs are inserted into the nose of the cartridge. On the 1875 you can shoot either BBs or pellets by putting them in the base of the cartridge, which is then inserted into the cylinder. The barrels are spring loaded, putting pressure on the cartridge, making for a good seal. Midway also has about the best price for extra cartridges. Since I use a steel bullet trap in my basement, I don't want to use steel BBs because of the chance of ricochet. The Bear River Schofield I ordered from Midway USA is due to arrive next Wednesday. This a very nice replica of the Schofield #3. I will now check on how to remove the barrel and replace it with a rifled barrel. 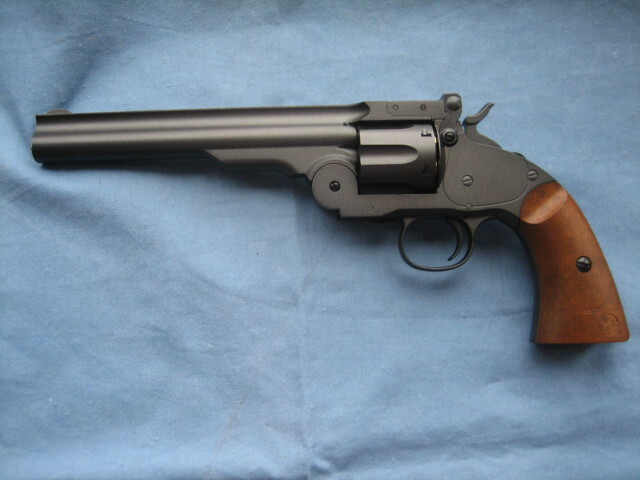 The main barrel has a taper from the breech to the muzzle. The frame barrel internal has a slight taper from breech to muzzle. I found that a Crosman .177 rifled barrel is a good fit at at the breech. Some machining of that Crosman .177 barrel should be able to replace the Bear River barrel. Today I tested the accuracy of the Bear River Schofield using lead BBs. The group from 30 feet was ~5", I want to puke. 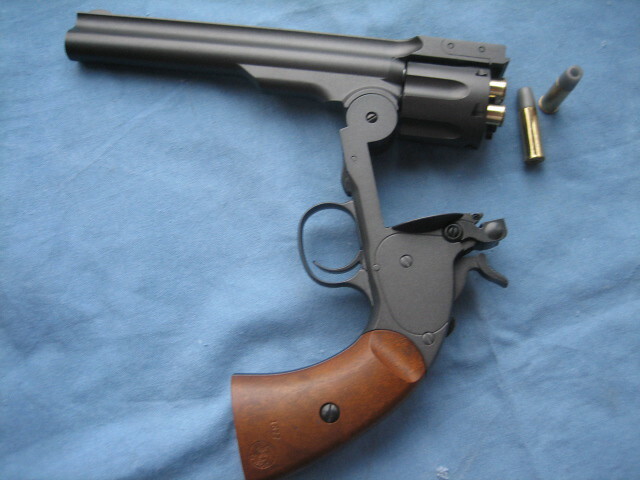 I have a long o.437 ream that can be used to ream the main cast barrel to accept the Crosman .177 barrel. Notice that the BB barrel has a spring at the muzzle to have the barrel at the breech push against the cylinder. I'm not sure if I want a free floating barrel or simply epoxy the rifled barrel to the main cast barrel. Hi, the more I study the barrel mounting system of the Bear River Schofield #3, the more I'm impressed with the innovative design that has the total gas path well sealed. 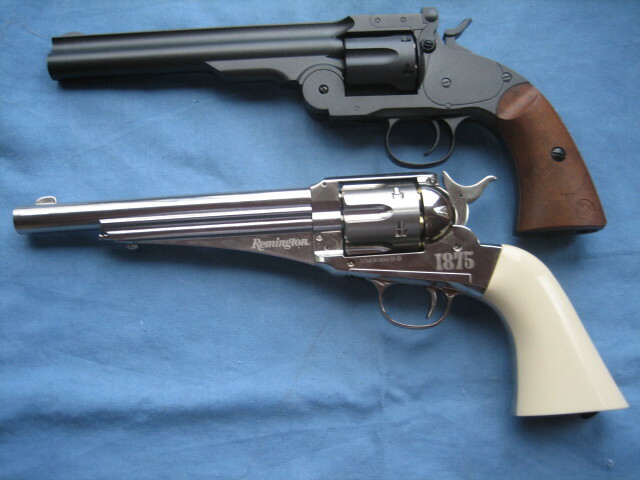 If I replace the barrel assembly with a solid rifled barrel, there will be cylinder/barrel gap to deal with. The revolver was reassembled and tested for accuracy with different projectiles. Using lead BBs produce groups of ~5"
Using copper coated lead BBs produced groups of ~4"
Using lead .177 pellets with the pellet shells produced groups of ~4"
Steel BBs did the best with ~1" groups, but there was always a flyer of 1 shot out of 6 shots ~4" from the main group. All the large groups are low and to the left. The small groups are right on in elevation, but 1/4" to the left. The more I think about this BB gun, the more I'm convinced to just leave it alone, it is what it is, and use steel BBs for tin can plinking in the yard. Those Crosman 2240s spoiled me with their accuracy of touching hole groups from 10yds. Richard, thanks for your report. I know you are an accuracy fanatic, but I too feel the gun should just be used as is.